Stephen W. Snively is the Honorary Consul for the Republic of Namibia in the State of Florida. He is also a commercial real estate attorney with the law firm Holland & Knight LLP in Orlando, Florida. 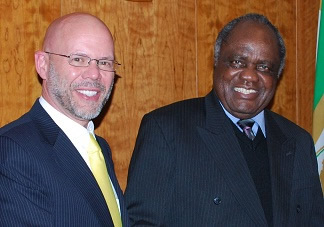 On August 20, 2007, Marco Hausiku, Minister of Foreign Affairs for the Republic of Namibia, on the instructions of His Excellency Mr. Hifikepunye Pohamba, President of the Republic of Namibia, nominated and appointed him as Honorary Consul of Namibia in the State of Florida, United States, to promote the economic interests of Namibia, especially by encouraging investment and tourism in the country. Namibia ("nu-mib'-ee-uh") is located on the west coast of Africa north of South Africa. It has a total land area of 318,000 square miles (about twice the size of California) but an estimated population of only 2,031,000 (slightly more than Houston, Texas). The capital city of Windhoek is located in the center of the country. English is the official language, which facilitates business dealings with the United States. Namibia has three distinct geographic regions: the deserts along the coast in the west, a central plateau, and expansive savannah grasslands in the north. The Kalahari and Namib deserts are among the most magnificent in the world. The latter has towering sand dunes that slope gracefully toward the sea. The wide open spaces and arid barren terrain of the central plateau contrast dramatically with the flowing grasslands in the north. Wildlife in Namibia is abundant and incredibly diverse. Etosha National Park is famous for the exotic animals which gather around its salt pan and water holes, including giraffes, elephants, lions, leopards, zebras, rhinoceroses, springboks, oryxes, impalas and many more. Namibia has the world's largest population of cheetahs, and there are tens of thousands of seals and pink flamingos along the coast. It is blessed with stunning landscapes, peaceful people, rich cultural traditions, exotic wildlife, a balanced democratic government and an incredible wealth of natural resources. At the same time, Namibia is burdened with the legacy of a colonial history and seventy years of apartheid rule, poverty and an HIV/AIDS epidemic. There are genetic markers in our DNA that record the history of our origins. The DNA from people around the world confirms that we all have roots reaching back to the continent of Africa. After the last Ice Age, the species Homo sapiens was on the verge of extinction and survived only in Africa. Then suddenly, about 50,000 years ago, it began to grow rapidly and migrated north to Europe and Asia, eventually populating the entire earth. We discovered from rock paintings that nomadic tribes roamed the plains of Namibia over 15,000 years ago. In 1486 the Portuguese established the city now known as Luderitz. It developed into a busy seaport where whalers and commercial ships sought refuge and replenished supplies on their voyages around the horn of Africa. The Namib Desert along the coastline was an intimidating barrier that discouraged explorers from venturing inland until many centuries later. Namibia became the German colony of "South West Africa" in 1890 pursuant to treaties entered into by Germany, Britain and Portugal. With the Germans came trade, missionaries and the Lutheran religion. Germany lost its control over the area when World War I began. In 1920, with the approval of the League of Nations, the government of South Africa took control over Namibia. In 1960 the South West African Peoples Organization, also known as “SWAPO,” began to urge the United Nations to revoke the mandate which granted South Africa control over the region, and by 1966 a guerilla war of independence was being waged to overthrow the apartheid regime in both Namibia and South Africa. The United Nations revoked the mandate of South Africa in 1968 at which time the name "Namibia" was adopted. It refers to the Namib Desert and is translated loosely to mean a bare place, vast arid plain or “area where there is nothing.” The United Nations imposed a regional peace plan but the struggle for independence continued for another decade. Independence from South Africa was declared on March 21, 1990, and was followed by free elections for new national representatives. Namibia emerged from its colonial/apartheid history as a constitutional democracy with a free-market economy. Namibia is not well known in the U.S., largely because for many years it was in the shadow of South Africa. During the struggle for independence the liberation army professed a Marxist ideology; it was supported by troops from Cuba and received weapons and other military support from Communist countries in Eastern Europe. The U.S. was concerned that the movement would establish a socialist government. Although that did not happen, the political and geographic distance from the U.S. also explain why many Americans knew nothing about Namibia until 2006 when Angelina Jolie and Brad Pitt selected it as the place for the birth of their daughter. One of Africa's newest democracies, Namibia is now recognized as one of its most successful democracies. The structure of the federal government is similar to that of the U.S. There are three branches: executive, legislative and judicial. There is a bicameral legislature consisting of the National Council and the National Assembly. The president is elected by popular vote for a five-year term. He appoints a prime minister and a cabinet, which may be dissolved by a "no confidence" vote of the National Assembly. The judicial branch includes a Supreme Court whose judges are appointed by the president. Roman-Dutch law is the common law in the country. The Constitution forms the legal backbone of the nation. This unique and progressive document reflects the compassion and humanity of the Namibian people, their determination to preserve the natural beauty of their country and their commitment to protect foreign investment. It contains a variety of provisions which contribute to the long-term political and economic stability of the country, making it more attractive to foreign investors. It recognizes many of the rights cherished by our forefathers in the U.S., including the freedom of speech and religion and the right to representation by counsel at a speedy and impartial trial. It prohibits the death penalty, establishes special rights for women and children and recognizes the family as the "natural and fundamental group unit of society." International non-alignment is mandated and a national ombudsman is authorized to independently investigate any misconduct of governmental officials or any "degradation or destruction of ecosystem and failure to protect the beauty and character of Namibia. This is the only constitution in the world that acknowledges the importance of protecting the environment. Representatives for the government in Namibia are among a new generation of leaders in Africa who understand the importance of a stable political and economic environment. 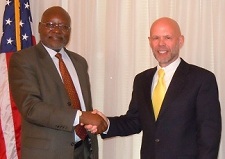 © 2011 Honorary Consul for Namibia. All rights reserved.